My article with Jason Brennan on “Estimating the Cost of Justice for Adjuncts” caused a bit of a stir over the weekend after it was featured in several news stories. Many of the issues we raise are starting to be realized as universities grapple with the adjunct issue in earnest and a number of the more tempered responses have noted the sobering reality of the budgetary trade-offs that would be necessary for “adjunct justice,” or the provision of even some current adjuncts with even a minimally good full time job. Actually, we addressed sports team spending and administrative bloat at length in the paper. In making this “criticism” you are actually signalling only one thing: that you didn’t even read the paper before offering an opinion about its contents, which is a strangely precarious position to begin a discussion of its contents. 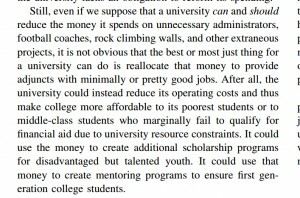 In our discussion we fully concede that administrative salaries and expensive sports programs are very real budgetary problems for higher education. I also personally agree with cutting back on spending in both areas (whether and to what extent it is feasible to do so is another question). 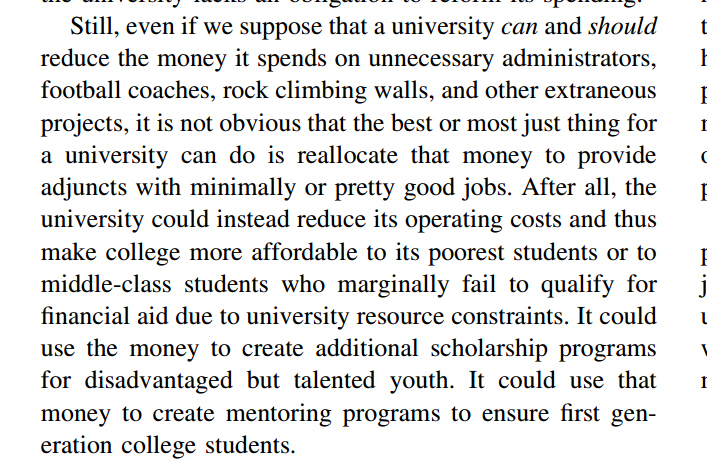 But simply diagnosing other budgetary problems in higher ed largely sidesteps the issue we raise, not to mention the arguments we actually make in the paper. As we noted, suppose that football could be cut or eliminated with ease. And suppose that administrative salaries were cut in half. This still does not answer the adjunct problem, as it is not clear that adjuncts are entitled to receive the recovered monies (why not devote it to tuition relief for students instead? Or scholarships for low-income applicants? Or student loan forgiveness? Or taxpayer relief for public universities?). We might also suppose the recovered money was reallocated to new tenure track lines for adjuncts. As we also note in the paper, even a modest investment of this type to account for the current adjunct teaching load would likely draw hundreds of thousands of new applicants from outside of academia, with a large percentage of them possessing stronger qualifications and better research records than many current adjunct faculty. We dub this effect “job gentrification,” and given that the majority of current adjuncts do not possess terminal degrees in their fields, its likely effect would be devastating to the current adjunct workforce. We derived our $50,000 baseline estimate from publicly available sources, representing the median entry-level full time salary for faculty in the United States. This estimate is also consistent with the U.S. Department of Education’s data and the AAUP’s compensation survey. Since the $50,000 baseline is derived from a median figure, there will – by definition – be some schools that pay less and others that pay more. This is a feature of any data distribution when measured by a midpoint. If we were to neglect the national median and base our estimates on your anecdotal salary observations, we might be able to reduce the adjunct justice price tag by a few percentage points at best, though doing so would occur at the expense of accurately representing actual data from academic market in the United States. It would therefore seem that your objection lies with a robust and widely accepted underlying data point rather than our analysis of that data point. I fully agree that it is a wildly unrealistic goal. But if you ask the SEIU adjunct activists, including the one cited in the main news story on our paper, they are completely serious about that goal. Your dispute is therefore with them. 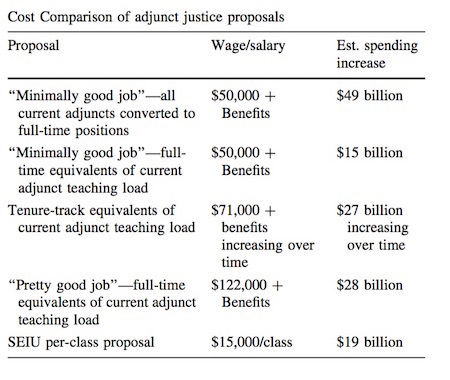 Actually, we only include the SEIU figure as one of multiple different estimates that we present from various competing “adjunct justice” proposals. We also include a $50,000 salaried baseline estimate for entry level faculty, a $71,000 salaried position for tenure-track equivalent, and a $122,000 salaried position for full professor equivalents. On top of that we break down these numbers based on the cost of providing a job to all of the approximately 750,000 adjuncts reported in US Department of Education data as well as a much smaller subset of about 260,000 adjuncts – a realistic conversion of the current adjunct class load into full time positions. Our figures come from the US Department of Education’s IPEDS survey, which is self-reported by each university. We are well aware of the double-counting issue that exists in these data and note as much in the paper. We also note that adjuncts commonly complain that their numbers are underreported by universities, and there is some literature that bears this out. 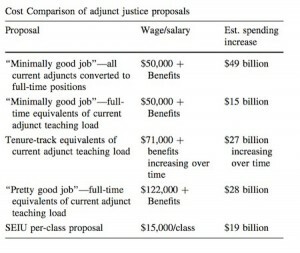 Still, if one were to generously discount the approximately 750,000 adjuncts in the United States by 20% due to double-counting, it would not reduce the numbers sufficiently to alter our primary “adjunct justice” estimates, which are based on providing a full time job to the current adjunct teaching load or about 260,000 positions. The remainder would find themselves out of work under this “solution” to the adjunct crisis. 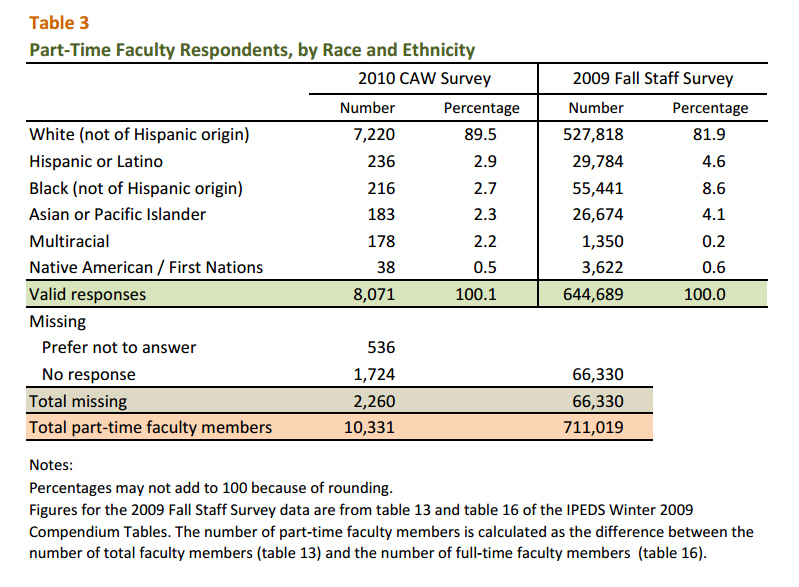 The adjunct workforce is actually an overwhelming 90% white according to the best available data on the subject. I will charitably assume that you invoked the race card out of ignorance of this fact, as opposed to attempting to poison the well of this discussion with a non-sequitur premised upon a false claim. The gender division of the adjunct workforce is somewhat more ambiguous. A 2010 survey by the Coalition on the Academic Workforce found a 62-38 female to male split. A 2009 US Department of Education accounting found a nearly even 51.6-48.4 split. This topic obviously warrants further research. I personally suspect that the 2010 survey’s disparity reflects the disproportionately large percentage of English/Literature faculty in the adjunct workforce compared to other academic fields, as English has traditionally attracted a larger percentage of female graduate students than many other academic disciplines. It may therefore be a product of the adjunctification of specific fields of study. In any case, the gender ratio of the adjunct workforce was not a part of our argument in this specific paper, which only addresses the costs of the adjunct workforce at large. Offering a loaded critique based on a point that we did not contest or argue in the first place is, at best, willfully uncharitable to our position. I more cynical response might note that it also smacks of an attempt to derail any constructive discussion of the costs and tradeoffs involved in any adjunct relief policy. I agree. The analogy is absurd and hyperbolic, as well as offensive to the victims of actual horrors and crimes. The passage you refer to was actually a reference to numerous cited and documented instances in which adjunct activists have abusively utilized comparisons to slavery, indentured servitude, apartheid, and sweatshop labor, among other things, to describe their working conditions. We emphatically rejected these analogies in our article, which you obviously did not bother to read before making this charge. Nonetheless they persist amongst a segment of the adjunct activist community. If you agree with my position though that these comparisons are ridiculous and morally insensitive, I’d strongly suggest that you consider communicating that concern to the adjunct activist movement. Our paper was published in a well-regarded mainstream venue, the Journal of Business Ethics. I’ll wager that most university libraries in the United States have a subscription to this journal. It would be extremely unconventional for a university library to deny access to an adjunct faculty member at the same university, so when you claim that you cannot access the article I strongly suspect that you are simply using the paywall as a canard to avoid actually requesting the article from your university library. The abundance of “criticisms” we have received over arguments that were in fact addressed at length in the article itself is also symptomatic of this pattern of simply making excuses to avoid actual engagement with our arguments. 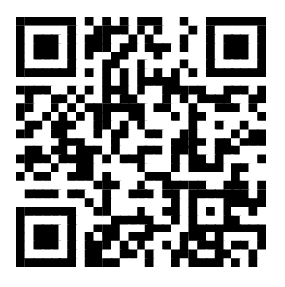 That said, I don’t make any money on article sales from the journal so I will also make a standing offer here to share the article upon request via email if you are still unable to access it after trying your home institution’s library. No. We’re simply pointing out that if you wish to dramatically increase the salaries of the adjunct workforce, it will require money. That money will have to come from somewhere. It may come in the form of higher tuition, or it may come at the expense of debt relief or scholarships for students – including low income students who are in a significantly more precarious economic situation than you believe yourselves to occupy. If you wish to advocate for significantly higher investments in the adjunct workforce you therefore need to be prepared to confront these and other trade-offs to advancing your cause, including where they might impose an additional fiscal toll upon students. Yes, this is an actual criticism we have received. It is not a serious criticism. It is also, sadly, representative of a deep-seated anti-scholarly disposition that exists in some quarters of the adjunct activist movement, and one that signifies a contempt for the peer review process that universities are built upon. I echo Jason’s sentiments that persons making arguments along these lines are probably ill-suited to be standing in front of a university classroom. You know the quality of discourse on a topic is low when people not only fail to consider or think about opportunity cost, but get angry if you suggest they should. “Adjuncts are slaves! Give us more money.” Okay, I’ve freed up $20 billion. Why give it to you rather than poor students who can’t afford college? “RIGHTWINGCONSPIRACY!” Gotcha. If you believe that is so, then I fully invite and encourage you to make your case in a written scholarly rebuttal to our argument or any part thereof. In doing so you might even increase your prospects of landing a full time job, as it will strengthen your CV to discuss this important issue in a published research contribution. You will likely need to read our article in full first in order to accurately represent its arguments, which, thus far, most of you have not actually done. You will also need to submit your critique for peer review in a suitable scholarly venue, just as we did when we wrote the original piece. For some of you this also likely means getting over your aversion to the notion of peer review, as well as actually committing your arguments to a written scholarly format. But I do welcome any such dialogue, assuming you are capable and willing to elevate this important discussion into a scholarly venue where it belongs. This entry was posted by Phillip W. Magness on Monday, March 21st, 2016 at 12:56 pm	and is filed under Uncategorized. You can follow any responses to this entry through the RSS 2.0 feed. Both comments and pings are currently closed.